Posted by Geoffrey Moore on Thursday, January 25th, 2018 at 3:45pm. Dreaming of a warm winter? You don’t have to if you decide to visit (maybe even relocate) to somewhere naturally warm, like Palm Springs, California. The early months of the year are among the best times to visit Palm Springs — you’ll avoid the summertime heat that residents know all too well while being able to enjoy the consistently beautiful weather. Palm Springs doesn’t slow down for the winter, and their event calendar is proof of that. Throughout the winter you will find many festivals. 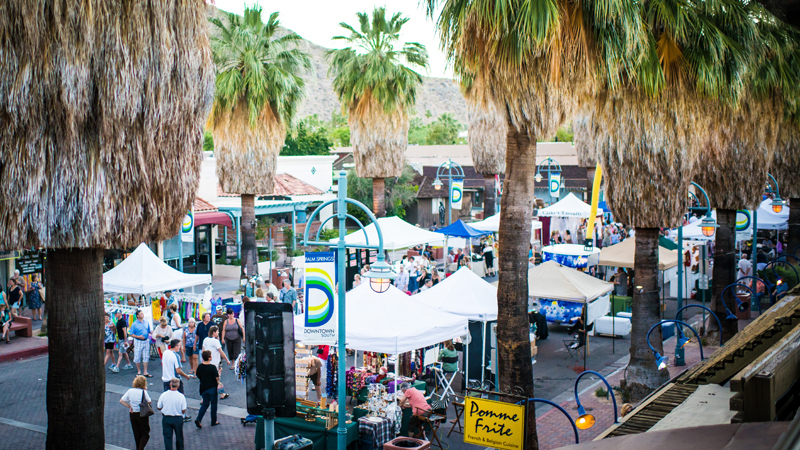 There’s the Villagefest Street Festival, a regular Thursday evening street festival in Downtown Palm Springs where artisans, entertainers, shops, and restaurants showcase their wares and samples to the public. If you’re only in the city for a short time, make sure you reserve some time to visit this event. Another popular regular event is in the neighboring city of Palm Desert, Palm Desert First Weekend. It’s a similarly free event with street art, food samples, and live entertainment, regularly boasting wide attendance, with many of its visitors including residents and tourists coming from the much greater populated Palm Springs. Those coming in February should look out for Tour de Palms Springs, an annual charity bike race, and Modernism Week festivities. During the 11-days of Modernism Week, people throughout the greater Palm Springs area celebrate midcentury architecture and design through bus tours, showcase homes, and a massive show and sale preview party. For all the auto buffs, there’s the McCormick’s Palm Springs Classic Car Auction that auctions off 600 classic cars at the Palm Springs Convention Center. All while soaking up the beautiful weather! Prices for the classic models range from $2,000 to over $250,000. The auction runs from February 22nd to February 25th. Tickets can be purchased at the gate for $15 a day, or you can buy a bundle for Saturday and Sunday. Even better, you can see 180 cars cross the auction block for free on Friday, February 23! If you’re an art lover, winter doesn’t have to cool your passion. The Palm Springs Art Museum and Palm Springs Air Museum both have exclusive exhibits for the coming season. There’s also the anticipated Palm Springs Fine Art Fair being held at the Palm Springs Convention Center in mid-February to look forward to. This three-day event showcases handcrafted products from artisans throughout the country. Want to swim or hike during your winter days, without worrying about frostbite? If you’re not able to rent out a vacation or condo with a private pool, Palm Springs has no shortage of premiere hotels, resorts, and spas with heated pools to accommodate your swimming needs, even in winter, including the 4-star Agua Caliente Casino Resort & Spa on Bob Hope Dr., the 24/7 Spa Resort Casino on E Amado Rd, and the 27-acre Oasis Resort on E Palm Canyon Dr.
Any outdoors person who knows their parks will know to check out Joshua Tree National Park. Though it’s a good 40-minute drive north of Palm Springs, the vast dark skies, sculpted landscape, and sprawling Joshua tree are an experience not to be missed. Outside of hiking and nature viewing, you can do some rock climbing, bouldering, bike riding, and even horseback riding. Being outside of Palm Springs, you’ll want to bring some camping equipment to spend the night under the stars to see a night sky free of light pollution. A night at Joshua Tree might drop to a low around 30-degree Fahrenheit, so remember to pack a warm blanket and maybe a hot drink. There’s also Taquitz Canyon, an enchanting oasis with a 60-foot waterfall on Agua Caliente tribal land. With its lack of crowds, lively scenery, and an inexpensive entrance fee, you’ll be able to thoroughly enjoy its strenuous 1.8-mile trail in solitude. Best of all, it’s drive is only a few minutes away from the city center. After spending a day at Tahquitz, you can try any of the three neighboring canyons that make up the Indian Canyons, which have even more trails and wildlife. While you’re out and about, drive a little west of the city and take the opportunity to travel in the world’s largest rotating tramcar, the Palm Springs Aerial Tramway. It’s one of the most fascinating modes of travel, though it’s only ten-minutes long. The tramcar takes riders two miles over the Chino Canyon to Mt. San Jacinto State Park’s Mountain Station, where there’s over 50 miles of hiking trails, documentary theatres, observation decks, restaurants, and a gift shop. Thinking about spending part of your winter in Palm Springs? Do more than just think about it. Explore all of what Palm Springs has to offerfor things to do. Whether you’re looking for kid-friendly activities, adventures for adults, or something in between, you’ll find it in Palm Springs. Don’t let a cold winter keep you indoors when there’s so much waiting for you in this desert oasis. Bear in mind, a trip to Palm Springs might end with you searching for a new home!